JJ Watt started out playing hockey, he attributes his athleticism to this growing up. In college, he left Western Michigan as a tight end to transfer as a walk on at Wisconsin. JJ Watt…a walk on? Crazy. His ultimate beach drink? He couldn’t remember the name, but he remembers drinking a bunch of them during a week at the Pro Bowl. I later found out the drink is called a Lava Flow, a mixture of strawberry daiquiri and pina colada. His first training camp was a shock, moving from Wisconsin to Texas. That summer in Houston he experienced 39 straight days of 100 degrees or hotter. Fifteen minutes into his first practice he thought he was going to die as he ran from drill to drill trying to impress the coaches (he was the only one running between drills). His first Jimmy Buffett show was during college when he went with his friends in a rented school bus to Alpine Valley. On the way home they got hungry, so they pulled the bus over on the highway and began to grill out again. Listen to the full interview to hear more about his favorite places to travel, cheeseburgers, and where his Margaritaville state of mind exists. After 30+ minutes of fun conversation, I realize we’re late for the Bing and Bong Show, so we end the interview and as cool and calmly as I can, I walk JJ and Charlie to the Bing and Bong set as if everything is on schedule. And as if I planned it this way, we arrive just as Jimmy says on air that JJ Watt would beat a hurricane in a fight. 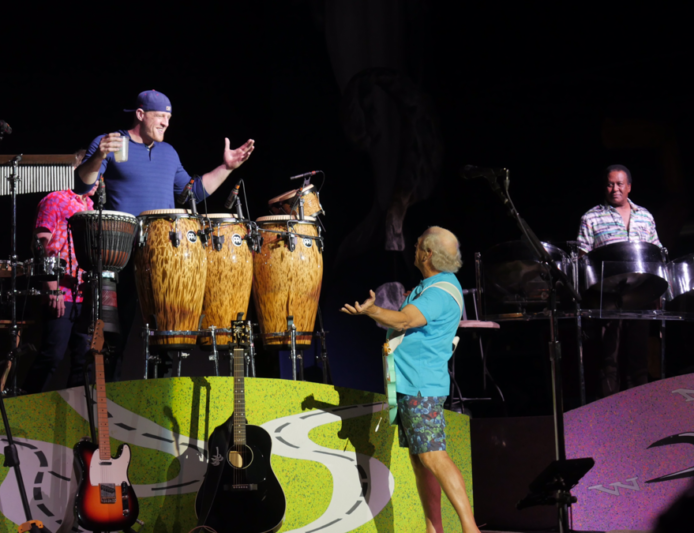 After the talk show, JB huddles up with JJ to ask him to come on stage to play percussion for Margaritaville. JJ smiles and says he’d love to…and as you can see in this clip, he plays a mean conga too. We set up two chairs for him and Charlie at the side of the stage and shortly before JJ’s Margaritaville cue he asks me if he can have a margarita. I told him I think we may have one around somewhere. I get JJ his drink as Jimmy calls him to the stage and the crowd goes crazy. I love my job. Listen to Heikki’s with JJ Watt on the Real Football Network. Author Heikki Larsen is the Production Coordinator for the Jimmy Buffett Tour and the writer and producer of Margaritaville’s Coconut Podcast.